Concrete and light. 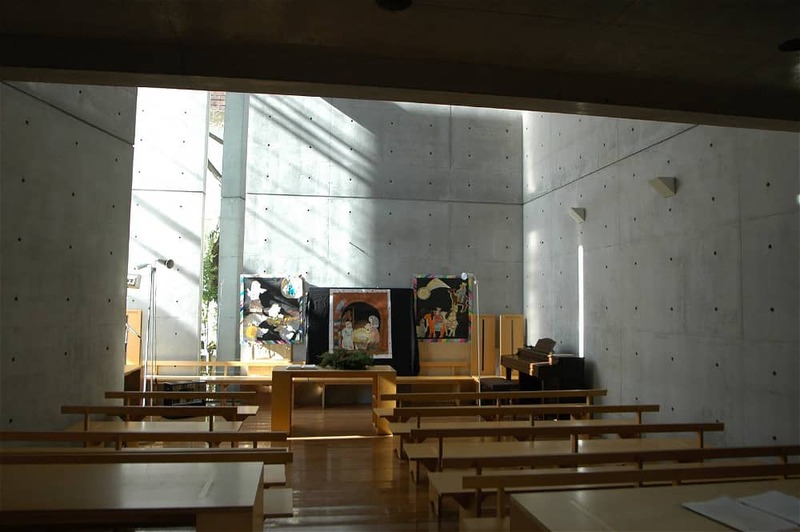 Tadao Ando‘s principal focus on simplicity and minimalist aesthetics in the Church of the Light is silencing. The church is located in a typical Japanese suburb, a cram of tradition and modernism on the outskirts of Osaka. Its load bearing walls are very simple and traditional, contrary to the modern architecture that has encroached the city of Osaka. Tadao Ando takes an ancient approach with this, especially when compared to Le Corbusier‘s insistence that a wall would no longer be a structural element but a mere membrane on the outer shell. 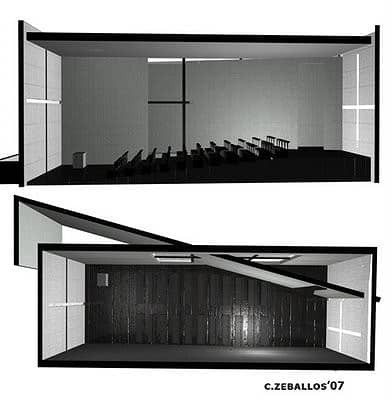 The Chapel consists of a rectangular volume of three cubes that are punctured by a wall at a fifteen degree angle that never actually touches the other walls or ceiling of the chapel. The geometry is nothing more than six walls and a roof, a minimalist end point that requires a thoughtful process that is able to eliminate anything else that is not relevant. This church of the light is a simple building that makes the most of what it can, a testament to the phrase “less is more”. Right from the exterior one is able to appreciate the honesty and authenticity of material. The purity that is found in the details is astounding. The reinforced concrete is void of any and all ornament that is not part of the construction process. 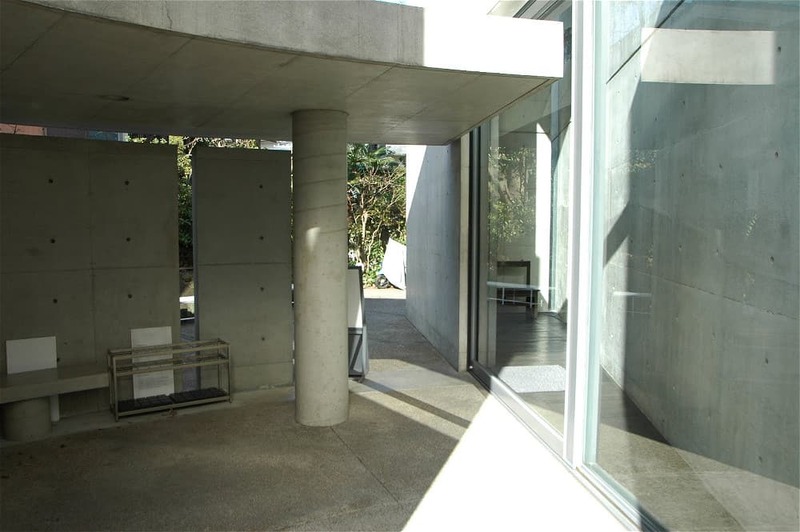 The seams and joints of the concrete are built with precision and care by master Japanese carpenters, along with Ando, that have worked to create an immaculately smooth surface and accurately aligned joints. So much so, that the seams of the concrete form work align perfectly with the crosses extrusion on the east side of the church. It possesses such a modest character that speaks of peace and tranquility. Its facade is a whisper, with only straight defined lines and one overall texture of by the concrete. Its introverted design serves as a physical connection between the congregation and the religion because the outside world is forgotten and the spiritual is seen inside this place. One of the slits that interrupts the facade is a cruciform that is cut into the concrete behind the altar. 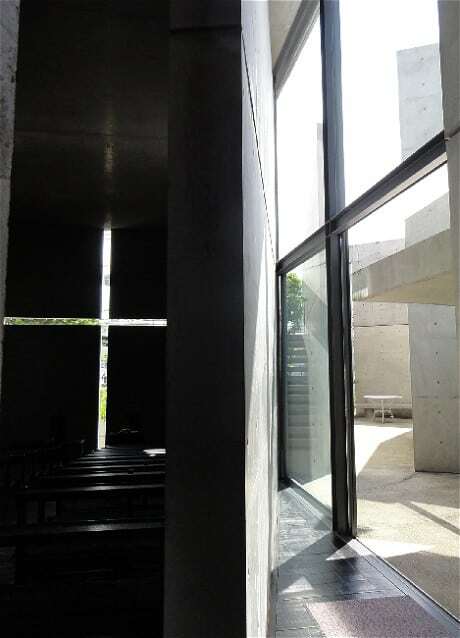 Tadao Ando has reduced religious paraphernalia to that simple cruciform extrusion, which is often criticized as disturbingly empty, void, and undefined. This is no surprise as minimalist design is often misread as little exertion put into the product. However, there is a whole level of design aesthetic implemented by Ando and his contractors that is priceless to a keen eye. Ever walked into a place and felt an overwhelming feeling of enlightenment? Most would say they felt so upon entering a massive ancient basilica or cathedral. The irony is that the Church of the Light, a small space of around 100 square meters, has the ability to raise awareness just by its genus loci. This is because the intricate play of void and light makes such a small room appear to be linked to such a great entity. One immediately feels the spiritual and secular within themselves, and is compelled either to proceed in submission or back away in mortification. The concrete itself adds to the darkness of the church by creating a more humble, meditative place of worship. Circulation into the space is controlled by the angled wall at 15 degrees to be precise. Upon entering the chapel, the wall is immediately encountered and forces a left turn into an interstitial space. It appears as a symbolic sieve, the narrow path, for the people who enter the church of the light. 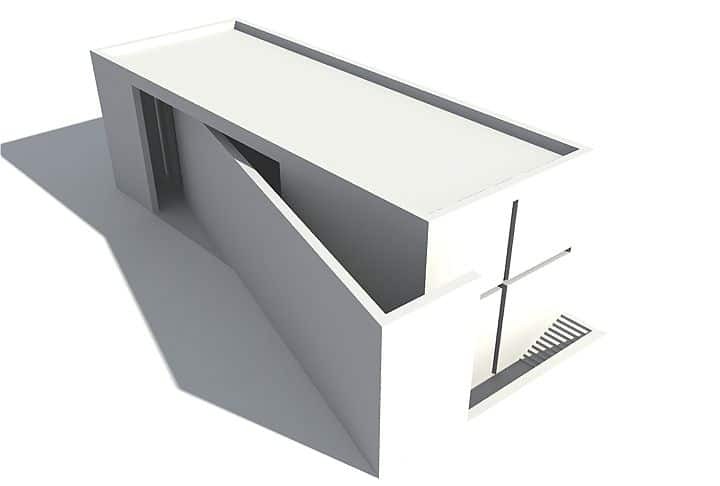 A tall threshold is cut into the wall allowing a right turn into the main chapel space. The purpose of the manipulation of the circulation sequence is realized as one passes through the wall. At this particular point one pivots around as they become totally aligned with the crucifix of light at the opposite end of the chapel. By keeping the amount of openings to a minimum, the power of the light emanating from the crucifix is intensified. The light from the cross and calculated slits on the building dematerialized the interior concrete walls and transforms the dark volume into an illuminated box. This has a surreal effect that perpetually changes material into immaterial, dark into light, light into space. He intersected intangible light and solid concrete in a manner that creates awe, befitting for a place of worship. It is almost hypnotizing and bewitching, separating the sinner from the saint within. In addition, the light is not just from fenestrations on the wall but also from the cleft between the wall and the ceiling. The shadow created is nothing short of spectacular. Church of the Light was a renovation to an existing Christian compound in Ibaraki. The budget was relatively low, about $250.000 US in construction costs, the financier being the church’s congregation. Ando addressed this issue by using his usual pallet of inexpensive materials such as reinforced concrete and wood. While the space is primarily defined by the concrete volume, wood is used for all of the elements that one engages such as the tables, pews, and floor. The Sunday School addition is intended to complement the chapel. Functionally it serves as a support space consisting of a gathering area, kitchen, office, and storage. Compared to the chapel, this building is less symbolic and stresses a home-like character. Like the chapel it is a rectangular volume penetrated by a freestanding wall. The wall plays a very submissive role in the Sunday School as opposed to its counterpart, the chapel. From the street it seems to be a reflection of the adjacent chapel wall. On the other side of the wall in the angled corner is a small courtyard space with a circular concrete bench intended for smaller gatherings. This church is seen as a place of retreat where the outside world is forgotten and the natural world is emphasized in a rather abstract manner, that is, Ando’s control of the light. This church beckons the fundamental simplicity of Christianity with its low-tech, yet powerful design.